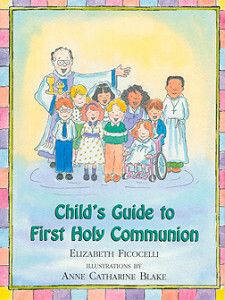 Paulist Press | Hardcover — Child’s Guide to First Holy Communion is a colorful picture book for children ages 5-9. Written in an easy-to-read manner and cheerfully illustrated in color by artist Anne Catharine Blake, the book shows children what to expect as they prepare for this very special sacrament. Interactive questions encourage discussion between the child and parent or teacher, making Child’s Guide to First Holy Communion an excellent teaching tool as well as a meaningful gift. Child’s Guide to First Holy Communion is a fantastic book for parents to read with their children in preparation for receiving their First Holy Communion. Not only is the book an engaging way to explain the importance and significance of receiving the sacrament, but it features contemplative questions to discuss with your child and allows them to express their own thoughts and feelings about this major milestone in a young Catholic’s life. My husband and I give the entire Child’s Guide series as gifts to new parents as an excellent supplement to learning about our rich Catholic faith. Concise and perfect! I bought this book for the fifteen kids who are getting prepared for Holy Communion in my catechism course. I found the book child friendly. As catechists we can develop from what is written in the book, and speak about own personal Holy Communion experience, etc. Very colorful; the kids love it. I was raised Catholic and wanted to get my daughter a book that would help her understand the importance of Holy Communion. I felt the book was creative, simple, and got the point across about God’s Love. I even enjoyed it. It brought memories of my own Holy Communion!! Wonderful book that explains the true meaning of Holy Communion in a fun, simple, and captivating way. Great for the children and the parents. Warm, loving, and includes everyone in the experience. For Communion preparation or renewal of understanding, this book is fabulous for all.